Angelo Meredino's life has been a whirlwind since his photo essay "The Battle We Didn't Choose" went viral. 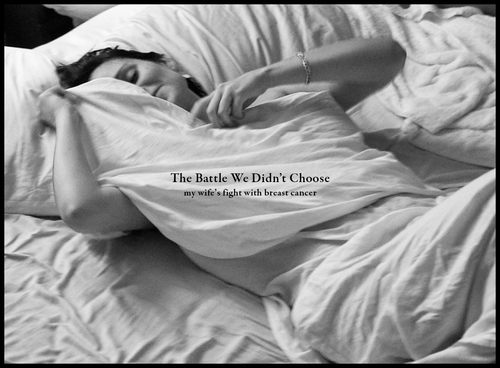 The photo essay depicts every step of his wife's battle with cancer. Since her passing in December 2011, Angelo has been working on a book that he calls his "love letter to Jen". The book will share photos from "the most personal and intense time of our life". The book includes many photos that were not originally used in Angelo's photo essay. His book "The Battle We didn't Choose" will be released September 1st. The release date holds special significance. September 1st is Angelo and Jen's wedding anniversary. The last eight months have been a "huge part of how I've healed", he tells me. "She made the most of life. I thought 'How can I handle things the way she did?' Putting this book together has been a step forward for me. Where I am with this book and where I am as a human being are parallel right now". The book also coincides with Angelo's non-profit "The Love You Share". A week before Jen passed, Angelo talked to her about setting up a non-profit. "The Love You Share" helps women with daily challenges such as paying for transportation costs and groceries. While Jen was receiving treatment, she had good disability from her job and organizations like the American Cancer Society covered her transportation costs to and from appointments. It made Angelo wonder how families without disability payments and the help of others paid the bills while facing cancer treatment. As I noted during our first interview in March, Angelo's voice still fills with passion when he speaks of Jen. "Jen left me with a lifetime of lessons. I know how much Jen trusted me. I feel she would still be as supportive today.A few days before she passed, I made a promise to Jen that the world would know about her." With his photo essay and now the release of his book, Jen and Angelo's story of love, perseverance and strength has traveled the world. Angelo has made good on his promise. *50% of the net profits of all book sales will be donated to "The Love You Share". "The Love You Share" has applied to the IRS for 501(c)(3) tax-exempt status. The application is still pending and therefore donations to "The Love You Share" are not currently tax-deductible. If tax-exempt status is granted, donations received while its application is pending may be treated as tax-deductible.